The next prayer in this series is also from the book of numbers. In this section of the bible Plan the author told a story about 2 boys who were discussing Elijah’s dramatic chariot ride when God took him home. One boy said to the other “Wouldn’t you be afraid to ride in a chariot of fire?” , “Nahh,” replied the second, “not if God drove.” Woww, what great faith that little boy demonstrated. Moses had the same kind of faith in Numbers 11:11-15. You may be asking, but Moses was complaining, how did he show faith? Earlier on in the chapter, verse 1 says : Soon the people began to complain about their hardship, and the LORD heard everything they said. Then the LORD’s anger blazed against them, and he sent a fire to rage among them, and he destroyed some of the people in the outskirts of the camp. The Israelities complained, and then Moses also complained. However, God responded positively to Moses and negatively to the rest of the people. Why was this? The people complained to one another, and nothing was accomplished. Moses took his complaint to God, the only one who could solve all their problems. Now, bringing this closer to home, many of us are good at complaining to each other about the many things that happen in our lives. We need to learn to take our problems to the One who can actually do something about them. Don’t get me wrong, it is good to talk to friends in order to get advice and support from them. But God has already told us to cast our cares and burdens onto him and he will take care of us (Psalms 55:22) There are times when our fellow human beings let us down, after all they are only human. They also go through things they cannot handle. Many of us make the mistake of discussing every little dilemma in our lives with friends and family instead of the one who knows the end from the beginning, God. As long as God was in control, Moses knew he could cope with the problems of leadership. Understanding his limitations, Moses cried: I am not able to bear all these people alone, because the burden is too heavy for me. In the 21st century, many of us like to think of ourselves as being self-sufficient. However, a person that is wise recognises his or her own limitations and depends on the presence and strength of God for their daily life. Letting God drive takes the tension out of living. When we learn to cast all our cares on Him, we move to a maturity in the Lord that gives peace and joy. Too often, we try to rip the steering wheel away from God to do things our own way. When this happens, we always get frustrated and lonely. Today, just like Moses did, may we leave the driving to God, admit we cannot bear our own burdens, and receive the rest He has promised for us. So, before you complain and run to your friends about something you’re struggling with , go to God. Seek God’s face first! Let God drive! This next prayer is also from the book of numbers. Aaron and Miriam learned in a hard way that criticism displeases God. Both of them were angry with Moses because of his recent marriage and they were very quick to find fault with him. Because of this Miriam was struck with leprosy, seeing what had happened to Miriam, Aaron pleaded desperately with Moses to pray for her. So in Numbers 12:1-13, we have an account of Moses’ prayer. Miriam was healed after 7 days because of his prayer to God. There are two vital lessons to be learnt from this prayer encounter. We must be very careful about criticism no matter how justified it may seem to us. Just like Moses, we must learn to pray for those who despitefully use us and say all manner of evil against us. Now, if you look around and observe situations in our daily lives, you can tell that people tend to argue over minor disagreements and don’t actually touch the real issue at hand. This was the same issue Miriam and Aaron had when they came with their complaint. The real issue at hand was their growing jealousy of the influence and position Moses had. Since they were unable to find fault in the way Moses led the people, they decided to criticise his wife. Instead of facing the problem directly by dealing with the envy and pride that was eating them up, they chose to create a diversion from the real issue. Anytime you are in a disagreement with someone stop and ask yourself “Am I arguing over the real issue or have I introduced a smoke screen by attacking someone’s character?”. Ask God to help you deal with the real issue. Jesus taught us that true children of the kingdom of God would live by these laws of kindness and mercy. My prayer for us all today is that God will grant us the grace to be merciful to those who criticise us. In the gospel of Matthew Jesus says, “love your enemies! Pray for those who persecute you!” (‭Matthew‬ ‭5‬:‭44‬ NLT). Luke also says “Love your enemies! Do good to them. Lend to them without expecting to be repaid. Then your reward from heaven will be very great, and you will truly be acting as children of the Most High, for he is kind to those who are unthankful and wicked.” (Luke‬ ‭6‬:‭35‬ NLT). Although it may be difficult, be merciful to those who criticise, pray that God will be able to help you face them. Don’t be like the young Persian who woke up to criticise others. The next prayer is also from the book of Exodus and was uttered by Moses. Did you know that there is POWER in presence? The presence of Clara Barton brought hope to the striken men of the Civil War. Moses also knew about the power of presence. As a man, Moses sought after the Presence of one who would spell the difference between life and death. He knew that if God was not with Israel, all was hopeless. Therefore Moses said, If Your Presence does not go with us, do not bring us up from here. Moses prayer in Exodus 33:12-23 is very appropriate for us today. As we are led through our own personal wilderness toward the Promised Land, we need the guiding Presence of our eternal Lord. He is not hiding from us but is there–an “ever-present help in the time of trouble.” God is our refuge and strength, always ready to help in times of trouble. (‭Psalms‬ ‭46‬:‭1‬ NLT) David, the psalmists says that even if the world ends, we need not to fear. In the face of utter destruction, David expressed a quiet confidence in God’s ability to save him. God is not merely a temporary retreat; he is our eternal refuge and can provide strength in any circumstance. So to conclude from this prayer, we should all learn to pray for the Lord’s guiding presence. There is power in presence. God’s presence gives us hope to face tomorrow without fear. At this time in the series, I am going to jump to the book of Exodus where we meet Moses and the Israelites. I’m sure we have all heard many Aesop’s fables, I’m going to share a humorous one. 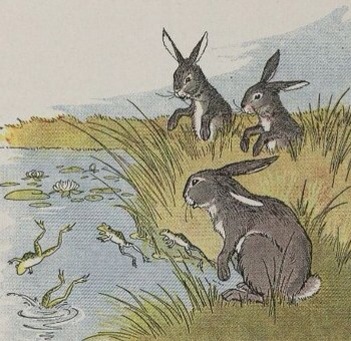 This fable is about Hares and Frogs. The hares lived with low spirits and lacked courage because their lives were in constant danger from foxes, lions, bears and men. One day the hares saw a troop of wild horses stampeding about, and because of their great fear of being killed by other beasts, they decided to drown themselves. They thought it would be better to drown themselves than to continually live in a state of fear. However when they got to the bank of the lake, the frogs who were sun bathing leaped into the water. “They’re actually afraid of us,” cried one of the hares. “We scared them!” The hares then abandoned their suicide plans and spent the rest of their days sitting around the edge of the lake frightening frogs. The way human beings reacts to things in life is often the same as how the hares did. Humans respond to their environment in anger or hostility and resort to self-destruction or destroying others. An example of this in the bible is Israel’s response when Moses went to the mountain to meet with God. After Moses had been gone for many days, despair set in amongst the Israelites. They began to feel sorry for themselves, they were lost in lust and destruction. Unfortunately, that was the evil sight which greeted Moses as he came down from the mountain. God was very angry that he wanted to destroy his own people. They were not grateful for what He had done for them, all they did was complain. But the twist is that Moses prayed and God spared Israel. But Moses tried to pacify the Lord his God. “O Lord!” he said. “Why are you so angry with your own people whom you brought from the land of Egypt with such great power and such a strong hand? Why let the Egyptians say, ‘Their God rescued them with the evil intention of slaughtering them in the mountains and wiping them from the face of the earth’? Turn away from your fierce anger. Change your mind about this terrible disaster you have threatened against your people! Remember your servants Abraham, Isaac, and Jacob.You bound yourself with an oath to them, saying, ‘I will make your descendants as numerous as the stars of heaven. And I will give them all of this land that I have promised to your descendants, and they will possess it forever.”So the Lord changed his mind about the terrible disaster he had threatened to bring on his people. The reaction that Moses had in time of crisis was the wisest one – he prayed. In times of crisis, How do you react? Who do you turn to? When trouble comes, we would be much wiser to pray than to react with hostility or give into despair. Prayer should always be our first reaction to any crisis. It is honouring to God when our first and immediate response to any situation is to consult him. As Christians we are told to “acknowledge Him in all our ways” and “Seek first the Kingdom of God”, we can accomplish this by making him our first consultant and advisor. That way he will be able to direct our path, just as he promised. If we properly engage in prayer, we are more likely to be kept out of crisis. If you haven’t done so already you can read the post entitled “Steering Wheel or Spare Tyre?” it elaborates more on prayer being our first resort. My prayer is that we all make it a habit to turn to God immediately in times of crisis. Go onto the tab “A Walkthrough the Major Prayers in the Bible” to view all the posts related to this series. The second prayer in the bible which was also by Abraham is in Genesis 17:15-22. N.B- A prayer is a conversation between a person and God. In the past, people such a Abraham could hear and speak to God clearly and directly such as the conversation in the account above. Abraham put legs to his own prayer, by sleeping with Hagar in order to have a heir. Abraham wanted to “help” God establish the covenant he Had made about being the Father of many nations. Abraham thought it was impossible for a man who was 100 years old to raise a family. He even suggested that God should let Ishmael be the chosen heir instead. Of course, God refused the request from this prayer because he had a higher and more beautiful plan for his servant. Abraham was willing to settle for second best, but God insisted on the very best for Abraham. Are you settling for seconds best, when God has destined you for the very best? We hear a lot about putting legs on prayer. In many cases, the admonition, in which the girl kicked the trap, is justified. However, we must remember that God refused Abraham’s “help” in working out His perfect will. God said “No!” to Abraham; and in hindsight, we can see the wisdom of that refusal. God was able to perfom a miracle, Sarah gave birth to Issac whom God established his covenant with. Think about your life at the moment, are you putting legs to your prayers? There are times when it is essential to wait and see the goodness of God, try not to be like the little girl who kicked the trap. Today, let us wait for God’s very best for us. When you pray to God regarding something in your life have faith in the way He has planned to answer that pray. Remember God’s plan is far greater than the ones we have for ourselves. I want to use this moment to apologise for my absence, I’ve been very occupied with my final exams. But Thanks be to God they are all over now. I have many exciting projects and plans for the summer and the rest of the year, which I can’t wait to share with you all. Firstly, I would start with a series which are centered around prayers in the bible. I just completed a bible plan which went through fifty major prayers in the bible. And I have decided to share my favourite ones with you. So, it has been said that Prayer can be compared to an old and worn out water pump. Now why is that? The water level in a pump that is used frequently is very high, therefore the water pours out instantly. However if the pump has not been used regularly, the water level gets low and a person must pump for a long time before the water finally trickles out. So how do we relate this to our prayers? If we neglect and don’t cultivate a strong prayer pattern, it would be difficult to recapture the sense of God’s presence. However if we maintain a good habit of daily devotions, there will be an increase in the awareness of God’s presence in our lives. Remember the words of the song we must have sang during our childhood; “Read your bible, pray everyday, pray everyday, pray everyday, read your bible pray everyday, you will grow, grow, grow”. We may not have understood the great message behind this song then, but now I hope you can tell that digging into God’s word daily and being in constant communication, through prayer, is the key to having a good and Christ-centered life. Genesis 15:1-6 holds the account of the very first prayer, recorded in the bible. As readers we catch a glimpse of Abraham’s faith from this prayer. The sort of faith Abraham had is one that goes beyond human understanding. Abraham was a very old man and he complained to God about not having a heir. Therefore God promised Abraham that he will be blessed with a son, despite his old age Abraham believed. From then on, Abraham was very expectant of the son that God will give him. In essence this is Abraham carrying the umbrella of faith in this first prayer. Of course there were sometimes when Abraham doubted, nevertheless he lived a life full of faith. What seemed impossible to Abraham became a reality because he believed God. What is that impossible thing that you are praying about? If you want it to become a reality and be possible, you have got to believe in God and pick up your umbrella of faith. One thing we can all take from the life of Abraham is that God ALWAYS honours the faith of his followers. James reminds us: let him ask in faith, with no doubting ( James 1:6) . When we marry our pleas and petitions with faith we will surely give birth to answered prayers. The scriptures tell us that: “Abraham believed God, and God counted him as righteous because of his faith.” (‭Romans‬ ‭4‬:‭3‬ NLT) Will God count you as righteous because of your faith? When you pray, you have to believe as well. As I share with you what I learned from the bible plan I completed, we will discover which prayers God answered and why and hopefully we will discover ways to improve our own prayers and develop a habit of constant prayer. As Christians it is not always easy to pray, reasons range from being occupied with other things to not feeling worthy to talk to God, however prayer is a necessary component in the life of every believer. So I pray that you will be able to gain something valuable from this series. ( A Walk-through the Major Prayers of the bible). Be sure to check my blog regularly so that you don’t miss the posts. Subscribe via email as well so that you can receive an email whenever there is addition to the series.